When we think of the uses of water in the construction sector, we often think of water for welfare and site processes and Water Direct delivers millions of litres of water to construction projects like this every year. We also provide water for special projects and are proud to be a trusted partner to Thomson Environmental Consultants and their specialist team Thomson Habitats in the creation of habitats for scarce and protected species. Thomson’s habitat team are specialist ecological contractors, appointed to construct seven of the 26 ecological mitigation sites needed for the central section of HS2 Phase One. This forms part of HS2’s commitment to ‘achieve no net loss of biodiversity’ in the construction of the flagship rail link between London and Birmingham. Being the largest project of its kind ever undertaken, the scale and complexity of the scheme was huge, and we were delighted to learn that Thomson were a finalist in the category ‘Project of the Year by a specialist contractor’ in this year’s Construction News specialists’ awards. 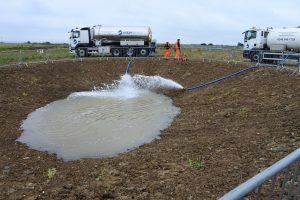 The project involved the creation of 37 lined ponds across seven sites along the HS2 route, ranging from 100m³ to 300m³ in volume. The ponds are designed to create new habitats for great crested newts, amphibians and reptiles to live once they have been translocated from areas along the rail route. The ponds are to be planted with aquatic flora and the banks seeded with grass, the sites are also to be populated with over 55,000 trees and more than 1.3km of hedgerow. Alongside this, there will also be the installation of fencing, gates, the preparation of soil and seeding of over 13 hectares with grass and wildflowers, installation of 24 bat boxes and construction of six reptile egg-laying heaps, 18 hibernacula (hibernation refuges) and 12 large reptile basking banks. Working on this industry recognised project for over a year so far, we’ve provided more than 5 million litres to date to the sites for pond filling. 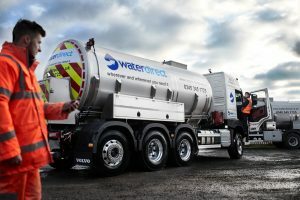 To ensure efficient delivery we utilised our state-of-the-art 19,000 litre rigid water tankers which are compact and manoeuvrable and offer cost-effective bulk water deliveries. These vehicles are large enough to make bulk deliveries in a single visit and small enough to access areas with restricted access, thus complying with the clients Construction Logistics Plan. Thomson’s habitat team has also been awarded a three-year maintenance contract across the sites, running until November 2020 to ensure the sites mature properly. We look forward to working with Thomson to provide ongoing support to the project, with the dry summer forecast this year, we expect to see increasing demand for our quality assured bulk water services. Water Direct’s expertise in large volume special projects was invaluable during the project and quality assurance was of the utmost importance given the environmental considerations. Water Direct’s Sales and Business Development Executive Gareth Page was proud to manage the water deliveries to the project, “It was a pleasure to work with Thomson on this project, their pragmatic approach and attention to detail is perfectly aligned with ours. I am really looking forward to working with them again on future projects”.